UPPERSTATE CHAMPIONSHIP BOUND!! Congratulations to Powdersville Varsity Volleyball on their 3-1 victory over Indian Land at home on Wednesday, October 31, 2018. 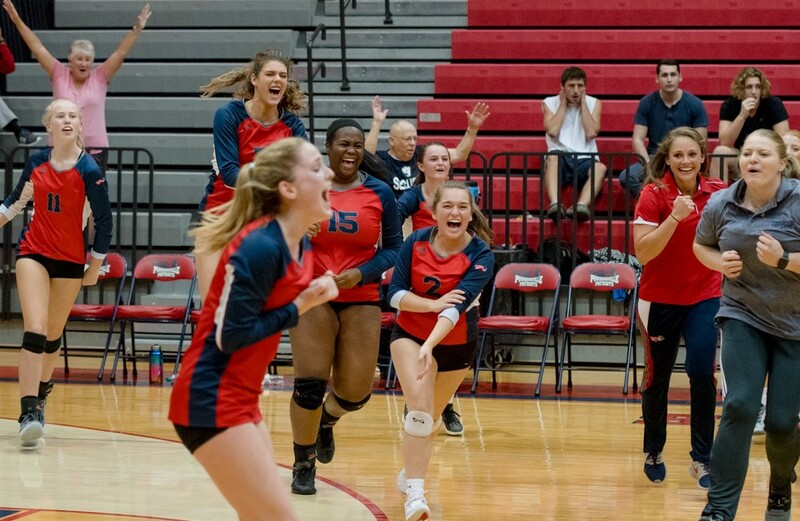 Lady Patriots won 25-21, 25-20, 22-25, and 25-18 to advance to the upperstate title match in Class AAA Playoffs. Lady Patriots worked hard for every point, with multiple volleys being the norm rather than the exception. In the first set, Indian Land was leading 9-14 when Powdersville rallied and turned the score around to 20-17, then kept the momentum going to win 25-21. Even though Powdersville led the entire second set, Indian Land re-grouped and reduced a 10-point deficit down to two points at 23-21, then Powdersville finished the set returning volley after volley to win 25-21. In the third, the score was tied 22-22 and Indian Land took the last three points to win their only set. In the final round, Lady Patriots came from behind 4-9, tied the score at 13, and led the rest of the way for the win. Such an intense match! Sophomore Grace O’Neill hit six kills, served one ace, and passed five digs. Senior Amelia Eggert received 10 serves and passed five digs. Senior Aspen Ridder served one ace, received 20 serves, and passed nine digs. Junior Reagan Davis served two aces, passed 10 digs and made 20 assists. Senior Kate Hardy Served two aces, passed 14 digs, and made 19 assists. Sophomore Olivia Knutson hit 10 kills with two solo blocks and one block assist. Senior Porcha Rivers hit six kills with three solo blocks and one block assist. Senior Savannah Roberts hit four kills with two solo blocks and four block assists. Junior Lexi Albright hit 17 kills, served one ace, and passed 17 digs. With the win, Powdersville (22-1 overall, 10-0 in the region) becomes one of the “Final Four” teams competing in the fourth round of playoffs. Lady Patriots will travel to Chapman on Monday, November 5, at 6pm for a re-match of last year’s Upperstate Championship. Make plans now to make the road trip and cheer for our Lady Patriots! #MakingHistoryEverySeason #GoPatriots! !